Bridgeport Non-insulated connector of 1/2-Inch trade size, provides screw-in connection to connect with flexible conduits. 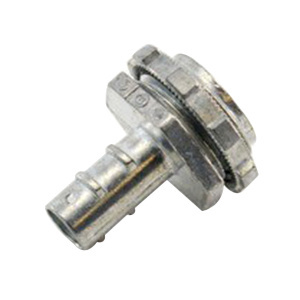 This connector in ball burnished, mirror smooth finish, has die-cast zinc construction for durability. The straight connector has 0.63-Inch throat diameter. It measures 0.94-Inch x 0.38-Inch x 0.94-Inch. Straight connector meets UL 514B E9391, CSA LR39354 and A-A-50552 standards.